January | 2013 | justonemorebiteplease! 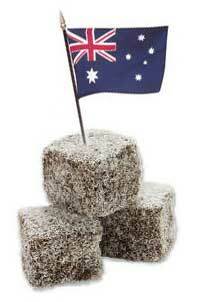 To celebrate, I’ve attempted to make Lamingtons. For the uninitiated, these are square sponge cakes coated in chocolate icing and desiccated coconut, served with (whipped) cream and strawberry jam. New Yorkers can find some delightful Lamingtons at Public, on Elizabeth St.
As I sit here on the couch waiting for my “Lamingtons” to bake, I realize that is not what I made. I have made a cake. As in, dense birthday cake, not light and fluffy sponges. 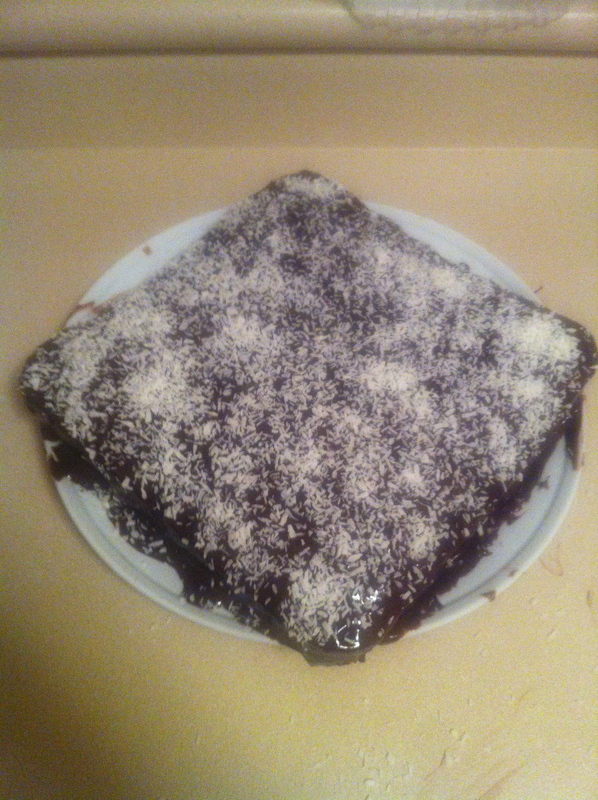 Hence the recipe name “Lamington Cake”, as I read it after the fact. I didn’t really think about it until I was elbow deep in butter and sugar, and I started thinking about how what I was making wasn’t going to turn into what I was imagining. I do have a tendency to not really read through recipes before I print them and head off to the store. Haha, luckily I’ve bought pre-made pies and sausage rolls from the Tuck Shop, so I hopefully won’t mess those up when I bake them. Inherent design flaw aside, I’ve had an interesting experience figuring my way through Aussie measurements and ingredients. I didn’t really consider the possibility that 1 US cup wouldn’t equal 1 Aussie cup until I was converting grams of butter into cups of butter and I stumbled across a very helpful website that listed ALL the conversions, for milk, sugar, butter, flour (dry cups, liquid cups, grams). Ohhhhh dear, were my thoughts, as I panicked through the rest of the ingredients. 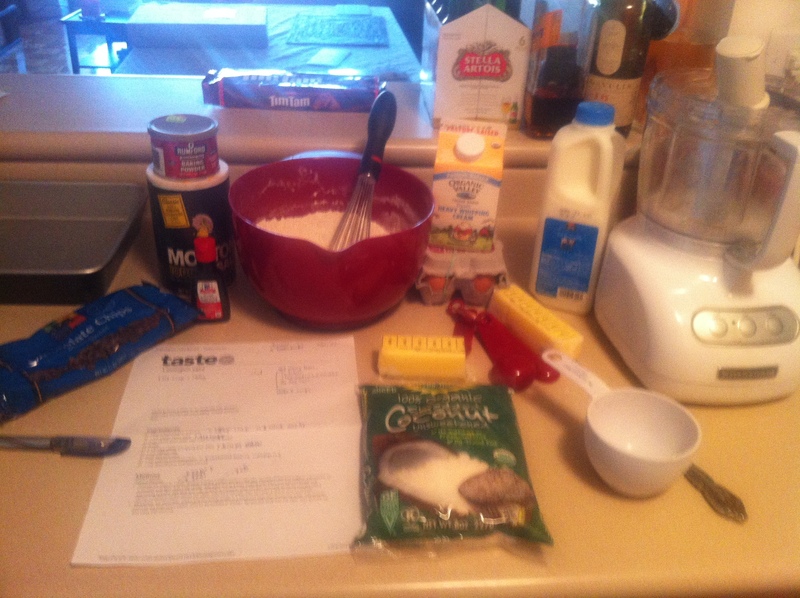 I ended up with funky conversions: 1.76 American cups of sugar, 2.8 cups flour, 1 and approximately 2/3 sticks of butter. Luckily my liquid measurer had milliliter markings, so there wasn’t anything too hard about pouring out 250ml of milk. I also had some ingredient interpretation to do, and why I didn’t do it before I left for Whole Foods, I’m not quite sure. A quick google in the store for “caster sugar” gave me table sugar. Okay, nice, I had that. The baking conversions website I’d found once I’d gotten home said that caster sugar = superfine sugar. Oh, this keeps getting better… baking is meant to be about precision and the combination of just the right ingredients right? My journey was not taking that shape. When I didn’t see self-raising flour on the shelves I turned to google again and found with relief I could just create my own by adding baking powder and salt. Phewf. And I learned something! If only I’d been so lucky with “thickened cream”. I had assumed, incorrectly, that it was the same as heavy whipping cream. Google says this isn’t the case, as thickened cream has gelatin in it. Damnit! This was not something I really wanted to contend with, and kept googling until I found the answer I wanted: heavy whipping cream would be fine. So once I had ingredient substitutions and measurement quandaries sorted, I began following the recipe. I quote, “process butter and sugar in a processor for 2 minutes until light… add eggs one at a time, pulsing…” When I read this, it sounded to me like I needed my food processor. Strange, but then again, you make pie crusts with your food processor. After watching my butter and sugar get stuck and seeing the blade in my processor not really having much effect, I determined that what they really meant was a mixer. I asked Mike, the resident Australian, but he didn’t know, as supposedly his cooking career had started (and ended?) in London. I ran this all past Beth, and she agreed, mixing butter and sugar was meant to be done with a mixer, not my food processor. This was, by now, comedy. Upon moving my butter and sugar mix to a bowl, I was able to successfully combine all of the components together, and get them into the oven. Victory! Yes, my friends, that is a cake. 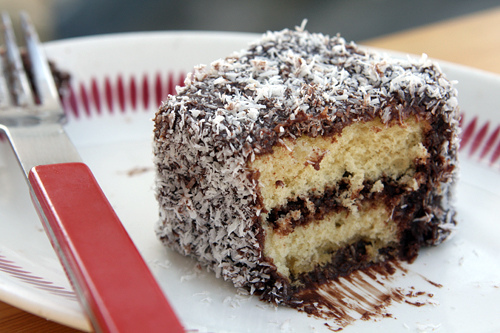 Lamington cake.